This is the second Elishewitz custom I have had the privilege of owning. Allen’s knives are superbly crafted and completely handmade, which makes them all that much more incredible. Many makers out there are using various CNC machines to produce many parts of their knives but Allen still does it all by hand. This is one of Allen’s older models, as he uses fancier pivots, thimbstuds and has a gold inlaid siganture disk now, and this model obviously does not have these attributes. 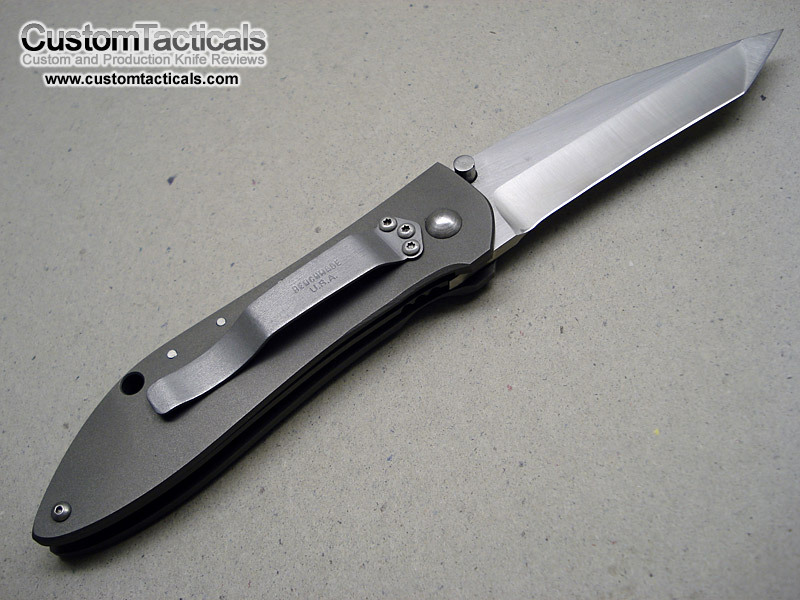 However, it has the classic Stryker design that Allen licensed to Benchmade and has not become a classic. In fact, the Stryker remains one of my favourite blade shapes as the flat blade edge allows for easy opening of packages an mail. The perfect knife for office folk like me. 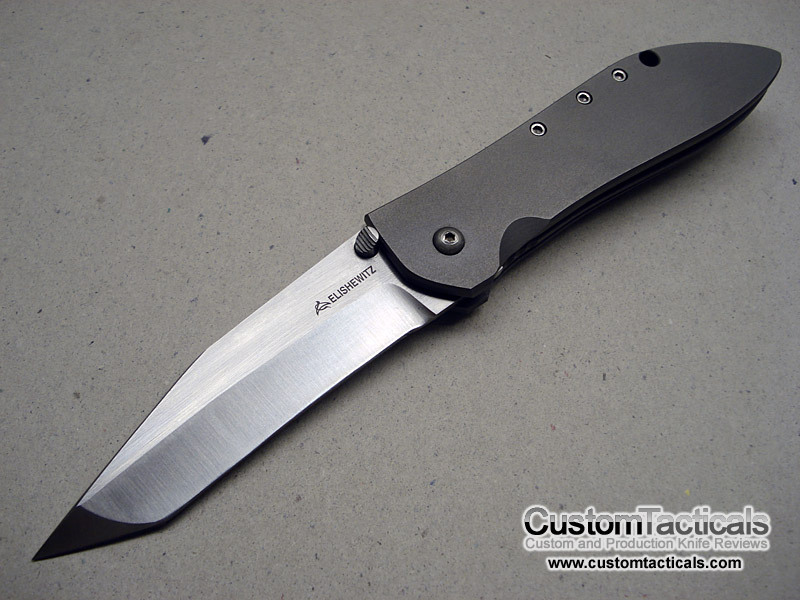 unlike the benchmade version however, this model has hollow main grinds and the tip is flat ground. The Benchmade version has flat ground all the way around. Also, this model has a slightly recurved main edge while the Benchmade model has a perfectly flat edge. These are fairly significant differences as it changes the blade geometry. The modified tanto blade of the Stryker gives it a pointing prodile allowing easy penetration and lends itself to both pratical uses as well as self-defense use if necessary. Steel on this guy is ATS-34, as it was popular at the time. I noticed that Allen’s grinds were not totally perfect on this knife, though its not obvious from looking at it. Running your finger down one side of the blade reveals that there is a slight imperfection in the grind, well-hidden by the Satin finish. Were it a mirror finish, the mistake would be obvious. The Titanium handle is not a framelock on this one, but does have Titanium liners for the liner lock, all fully bead-blasted. Lockup is perfect, and has tons of room for wear. Pocket clip on this one is one of Benchmade’s, which was typical for Allen’s knives at that time. Overall this is just a really sweet knife with a great history as it was his first collaboration with Benchmade, and has gone on to become one of their most popular designs. Their relationship has since deteriorated (as many of Benchmade’s have) and he now works with CRKT. 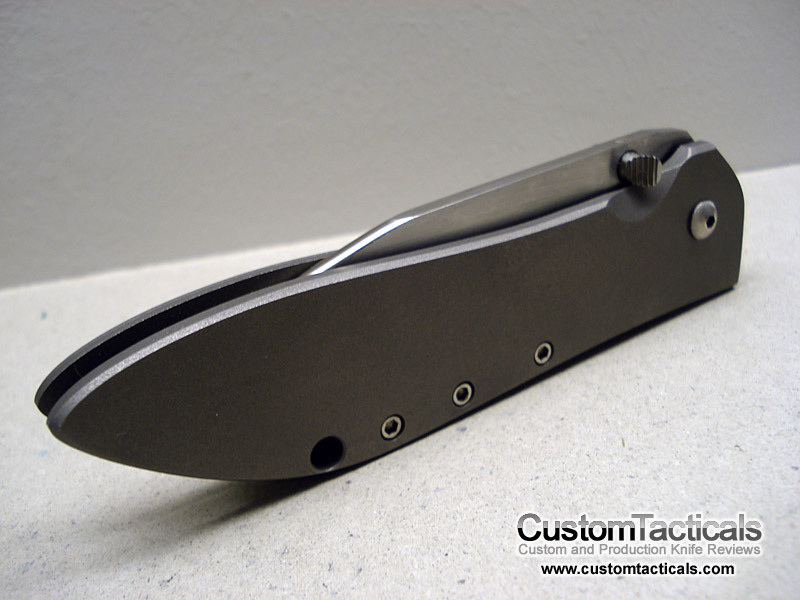 The Custom Stryker is a very understated and practical user especially if you are planning to carry it.